* Fits 5.11"-7.68" (130mm-195mm) wrist and 0.88"(22.5mm) in width. * Available in 9 colors: white, pink, mint green, black, red, orange, purple, midnight blue, gray. High-tech surface finish and premium soft silicone watch strap fits your device and feels comfortable on your wrist. Fits 5.11"-7.68" (130mm-195mm) wrist. 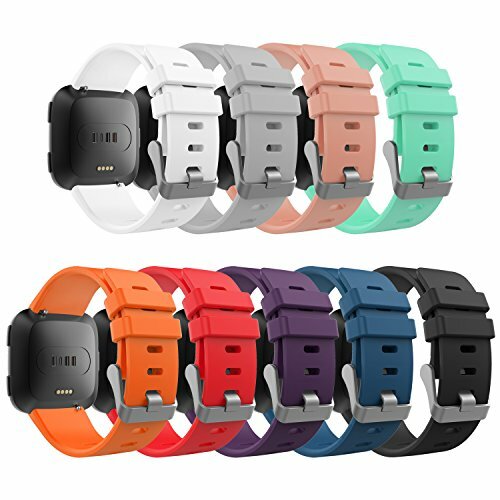 Made of high quality silicone material, this replaceable Fitbit Versa Smart Watch band for woman man with connector is durable and long lasting. Available in 9 colors. 18 Months Warranty: MoKo stands behind the quality of everything we sell. We provide worry- free service. If you have any question or problem, please contact us, we will resolve it for you effectively..